Most of the online traffic today is consumed in videos. 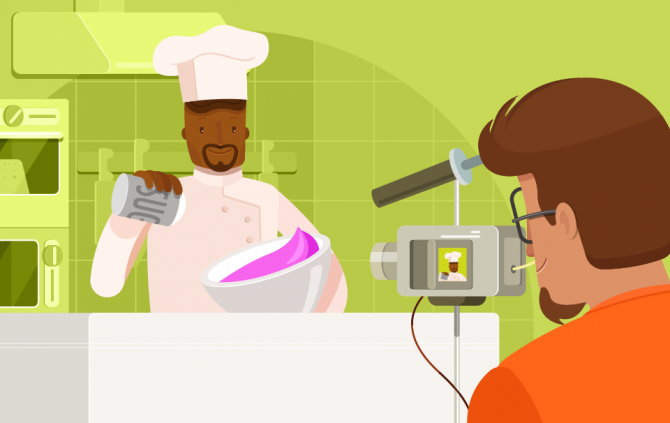 Learn how to make an excellent video and boost your digital business. You’ve probably heard that video is the medium of the future. While some studies point out that video will be responsible for 69% of online traffic many entrepreneurs are hesitant to use this medium in their business, simply because they are afraid of not doing it well. For many people, it feels like an overwhelming work, but the truth is that recording a nice video is simpler than you imagine. And, to help you out, we have prepared this text with many tips so you can venture in front of the cameras and make an excellent video. Before you record a video, you first need to understand that this process can be divided into three moments: pre-production, production, and post-production. If you keep up with the latest news about cinema, you have surely heard these terms before. Let’s learn a little bit more about each of them? Pre-production: it’s the planning stage, and involves everything concerning the preparation for the recording. Production: it’s the recording stage when you put everything you have prepared in the previous days into practice. Post-production: it’s the final stage when you edit and make the right adjustments to make everything work perfectly. Each step is of extreme importance in the process of creating a good video, that’s why we will go over each of them and provide a handful of tips so you do a good job in your videos. Question number 1: what is my objective? You need to answer this question before you start thinking about the next steps for your video. After all, to learn how to make the best video possible, you need to define your objective. Generate more leads? Convert more sales? Increase your authority online? When you understand the result you expect to get from your video makes it is much easier for you to find the right path. Next, you need to have in mind what you will record and how you will record it. To do so, think about a script of what is important to say or questions to ask in an interview, in case you’re going to conduct one. The script will help you to record more objectively and make all the post-editing process much easier, besides making the video clearer and more attractive for those who are watching. A golden tip is to always print the script to have easy access when you’re recording. You can also put it in a visible place, for example, to remind you of the topics whenever necessary. Also, try to save the script in the cloud, using Google Docs, for instance, and open it on your smartphone. This makes it easier to share it with the person behind the camera, recording the video or helping out. With the script in their hands, they can help you achieve better results. The next step in the pre-production stage is to define the location for the video – that is, where it will be recorded. Try to find a place where you can have greater control over the interference of external noise – then it will be easier to have better audio quality. Avoid busy locations, next to building sites or places with a lot of traffic, for example. And if you can find a place with both silence and a pleasant setting, even better. After all, the appearance of the video is an aspect that has to be taken into consideration. Next, pay attention to the time you choose to make the recording. Natural light is an important ally when creating a good video, and you should make the best use of it possible. A nice place, but one that doesn’t have a lot of light may not be as interesting as an OK place with excellent lighting. Natural light in the early hours of the morning, from 6 to 8 A.M., is usually a more golden light, with a low sun. This kind of light helps you to create an interesting look for your video. And from 8 to 11 in the morning, even with a stronger sunlight, there are still fewer hard shadows, so it is another time frame to be considered. You can also get an interesting light from 2 to 5 in the afternoon. In this period, you can get something similar to the aspect of early morning, which provides good lighting for your recordings. From 5 P.M. on, you start to get twilight, and the day gets darker really fast. So, be careful when making a video in the afternoon – you might end up having to stop the recording half-way. Lastly, avoid recording from 11 in the morning until 2 in the afternoon to manage to make a good video. At this time frame, we have the famous midday sun, casting hard shadows under the eyes and making the image poor. Our tip is to avoid this time frame when recording videos at all costs. If you are recording your video indoors, you have to use proper lighting to make the best of the settings. But don’t you worry: you don’t need to spend a fortune in lighting to build settings like the ones in Star Wars. There is a very simple setup of lights that will do for most of the situations. 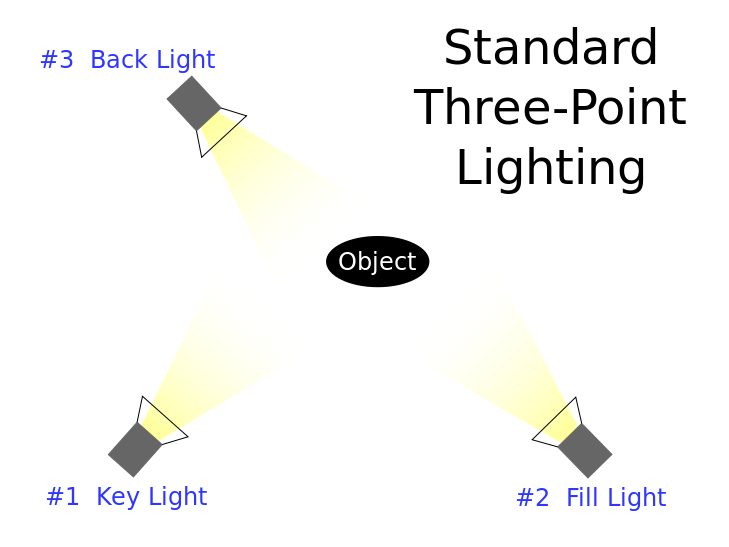 Just like in the image below, you will rely on three point lighting: two in front of the presenter or person being interviewed at each side, and a backlight. This last one provides a nice contour effect in your images, leading to a very interesting result. Do I need an advanced camera to record a good video? The answer is ‘no’. Of course, it is important to have a nice, crisp image, but even your smartphone will do. If its lens is reasonably good, it will certainly do its job for those who are starting out. As your business grows, then yes, it will be worth investing in better equipment. In this phase, the most important thing is to capture good audio – which is actually more important than the image itself, since it is directly connected to the understanding of the image by the spectator. Generally speaking, people tend to tolerate poor image much more than they can tolerate poor audio quality, and that’s why we recommend you buy a lavalier microphone with a 3.5 mm jack. You can find very affordable models in the market, and you can plug it directly into your smartphone, and then create a video with a good audio quality. When it is time to record, always have a friend or colleague around, to help you with technical issues. And don’t forget: it is perfectly normal to make mistakes, and you can make the necessary adjustments in the next phase. So, keep cool and try to transmit your message as clearly and directly as possible! After you have finished recording your video, it is time for the post-production – here, you will need to edit your video. This is a very important step in creating a good video and making your content more dynamic and interesting for those who are watching. Remove everything that is too much, including content, and also the moments where there is hesitation. Refine your material as much as possible. Rest assured: this will make all the difference in the final result. To edit your video, you can use programs such as Windows Movie Maker, or other free programs. The resources that you can find are usually very simple ones, but they will do to make simple cuts. But if you are already familiarized with video editing and wishes to use a more powerful program, with more features, you can invest in paid ones such as Adobe Premiere and Sony Movie Studio. And don’t worry if the final result is not perfect. In time, you will be able to improve your techniques and how you behave in front of the cameras. Do you want to see an example? Look for old videos from entrepreneurs who are authorities in their niches and see how they have improved with time. There’s something that is always within the reach of anyone who works with video: a roll of masking tape. This material is extremely useful for any last-minute fix, such as securing a cable, for instance. The tape is indispensable, and it can be found at any toolbox, even in the most prestigious network studios in the world, and it will certainly be very useful for you as well. So, what did you think of our tips? How about putting everything into practice right away? Let us know how you’re doing in the comments section below! Copywriter, screenwriter, and sports analyst in his spare time.